BUT the surgery went well. He is over the first day hump. Now he has the recovery road to go down. There has been NO art time for me lately but I do have a few older journal pages to show you. Here's my Halloween page. I was picking up my box of stamps to tuck it away on an upper shelf, and I just played with them before packing them up. Yes, I have quite a few, which I have been collecting for the last 15 or so years. I can't help picking up a few each year when I see something interesting. They are rather fun! Once things settle down I will catch up on my blog reading. Hope everyone is doing well. WONDERFUL NEWS!! I'm so thrilled for you. Love the witches, especially the ones on the bikes. Of course, I also adore the pumpkin with the cat inside. I am so pleased for you that your hubby is in recovery from his operation. I hope he will be able to leave ICU soon and all continues to go well for him. Hi there! I hope your husband is doing well. And you too - it can be tough having someone in the hospital. I enjoyed seeing your Halloween page and all of the stamps. But I REALLY love your new blog header! Hope you and your husband have a good week! This is good news about your husband, Erika. I hope the road to recovery is smooth and no bumps. I'm sure you've been terribly worried about it and I hope as things move along you'll be able to get back into the groove. I love the pages you showed. Made me smile. Great to hear that everything went well! Best for the hubby that he recovers fast now!!! Great images on that page! Congrats on a successful surgery! :) I trust recovery will go quickly and smoothly. So far so good. I'm glad the op went well for your hubby. Now the long road to recovery. continues improving and soon out of ICU. 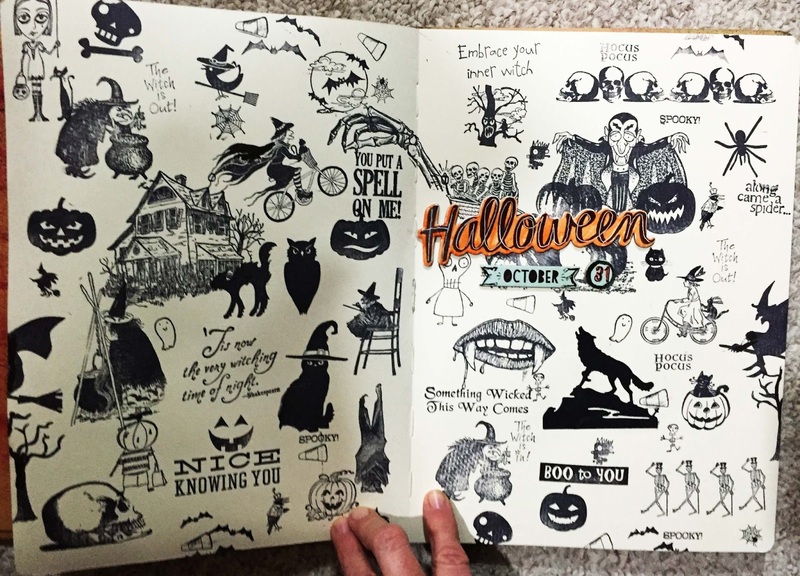 Your Halloween page is fab - what a great selection of stamps you have. Did you know that you can shorten your urls with AdFly and get dollars for every visitor to your short links.